Ireland men's hockey team have qualified for the Rio 2016 Olympic Games after Australia beat New Zealand 3-2 in the Oceania Cup final on Sunday. Australia's success left a place for Ireland as the team who ranked highest at the Hockey World League semi-finals in July, who had not already qualified. Ireland finished fifth at the Antwerp event and are the 11th team to qualify. 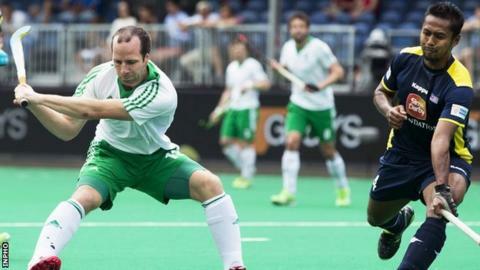 It will be the first time in more than 100 years that an Irish hockey team has participated in an Olympic Games. Ireland put themselves within touching distance of qualifying for the Olympics for the first time by beating Malaysia 4-1 in a play-off for fifth place at the World League in the summer, but had to wait more than three months to have their place confirmed. The coronation of Australia as continental champions meant an extra place being allocated to the World League. The Irish men, who made history by winning a bronze medal at the Eurohockey Championships in August, will become the first to represent Ireland in a team sport at an Olympic Games since 1948. Ireland picked up silver medals in the inaugural Olympic hockey event, which took place in London in 1908. "It probably hasn't sunk in yet but we're over the moon. It's testament to what the guys have achieved this year on and off the field," said Ireland coach Craig Fulton. Ireland will join Brazil, India, Germany, Canada, Spain, Belgium, Great Britain, Argentina, Netherlands, Australia and one remaining qualifier at the Rio 2016 Olympic Games, which take place from 5-21 August 2016.